On a recent girls trip to Orlando, we decided to do something different. 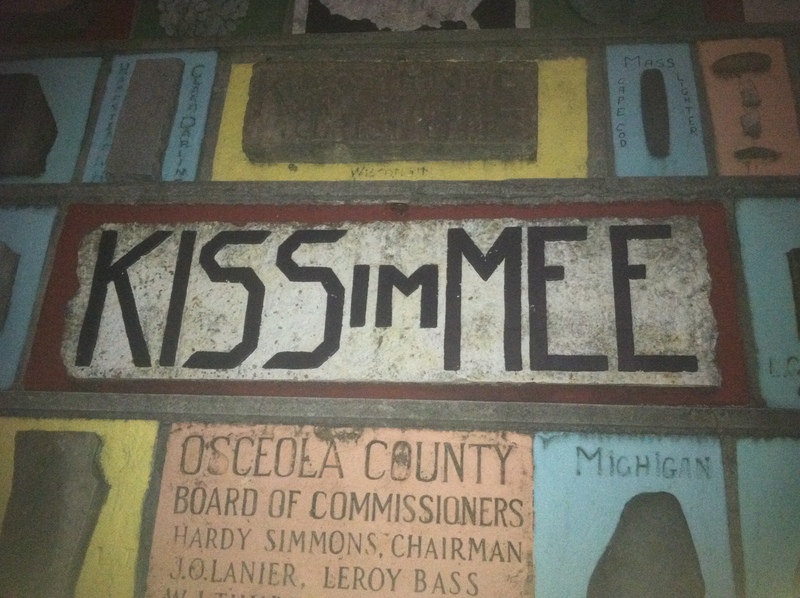 As fans of ghost tours (Seattle’s Park Place Market, St. Augustine Dark of the Moon Tour, and Key West Ghost Tours), my friends Sue and Lory and I decided to check out the Kissimmee Ghost tour. This is also the first ghost tour where I had my first ghostly encounter. We met our guide at the Welcome Station at the corner of Broadway & Dakin in Historic Downtown Kissimmee. This little building used to be a Standard Oil Station and is the perfect place to start the tour. There are flashlights, disposable cameras, and ghost hunting tools for sale. 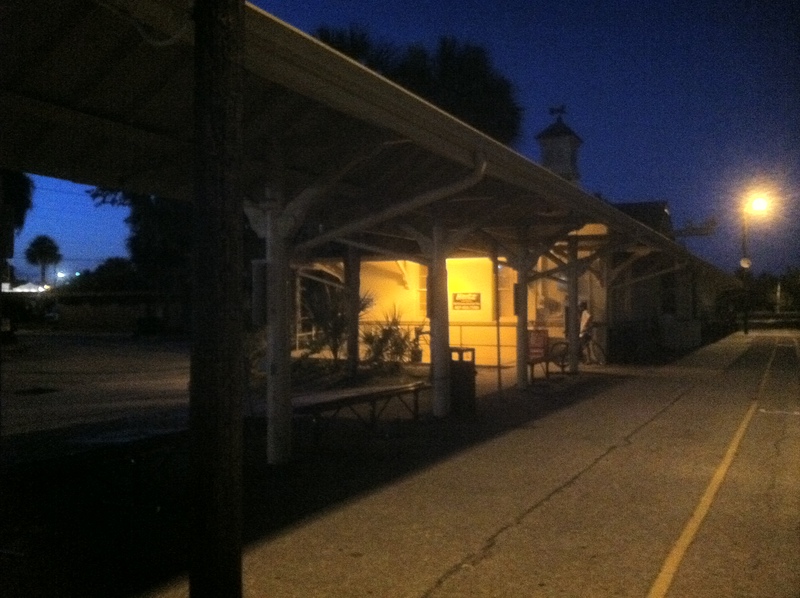 Be sure to make use of the facilities before you head out for your 90 minute walking ghost and history tour through the dark, haunted streets of Kissimmee. Our guide for the evening was Ashley, a Florida native, who led our group of 3 Florida residents (Sue, Lory and I) and 5 Aussies (love their accents). Our first stop was the train station, built in 1883 and it is still an operational Amtrak Station. We sat on the benches while Ashley told stories and showed pictures of orbs taken by previous ghost tour guests. According to ghoststudy.com, orbs are ghosts in the form of balls of light. They are thought to be the life force of those who have passed on. As fate would have it, a train came by. Ashley instructed us to take pictures as the train was moving by, which we did. Unfortunately, our only orbs were the golden glow of the street lamps. As we continued on our journey, we crossed the tracks again near the power plant. This is where Sue had an uncontrollable urge to push Lory off the tracks. Hmmmmmm. Another interesting stop was the Monument of States which was begun soon after the sneak attack on Pearl Harbor. It’s quite an interesting tale and worth a visit in the daylight to be able to check out the whole monument. Another place worth a daytime visit is Susan’s Courtyard Cafe. There are ghosts plus I hear the food is great. Hopefully the next time we make the trip to Orlando, we’ll stop by for lunch and check out the inside of the Cafe. As we continued down the street, we arrived at the Osceola County Historic Courthouse which is the oldest operating courthouse in the state of Florida. Ashley told us stories of the hanging tree and a man who proclaimed his innocence until the day he was hanged. He’s apparently still wandering around the grounds along with a woman in white that hangs out on the balcony along with a ghost of a judge. One of the last stops on the tour is where I had my encounter. We stopped at a funeral home playground (yes a playground on the funeral home property – Really – what a great idea). I sat on one of the swings as Ashley was telling a story about a young polio victim named Isabelle who loved the playground. In the middle of the story, I felt a cold chill that started at the base of my spine and went straight up to my hairline. It felt like icy fingers sliding up my back. I didn’t realize I could move so fast as I jumped out of the swing. The chill lingered and the swing kept moving long after I was out of it. Okay, Isabelle, sorry I sat in your swing. We enjoyed our ghost tour experience. Ashley was friendly and knowledgeable about Florida history. It’s definitely worth a trip off the regular Orlando beat of amusement parks and outlet malls. Maybe you will meet Isabelle, the hanged man, the woman in white, or someone who didn’t quite make the train. Use bug spray before heading out — there are mosquitoes. This entry was posted in Ghost Tours and tagged Florida ghost tours, Haunted Kissimmee, Kissimmee Ghost Tour, Monument of States, Orlando, vacation. Bookmark the permalink. Thanks for the review 🙂 I’ll definitely be checkin’ it out!